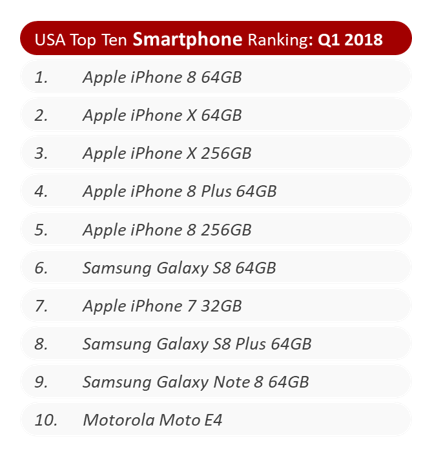 Six out of the top ten smartphone model SKUs were from Apple with iPhone 8 & X 64 GB versions the most popular. Surprisingly, the US market saw a weaker prepaid segment during the post-holiday season quarter. 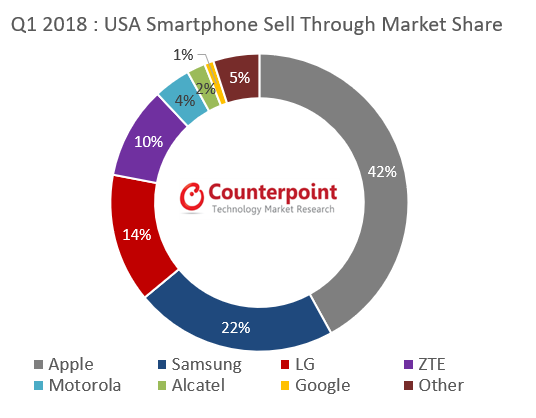 According to the latest research from Counterpoint’s Market Pulse program, the US market sold-through 38.7m smartphones during the first quarter of 2018. This is a 11% decrease from Q1 2017 when sales were 43.7 million smartphones. Sales had not dropped below 40 million for the last 3 years. 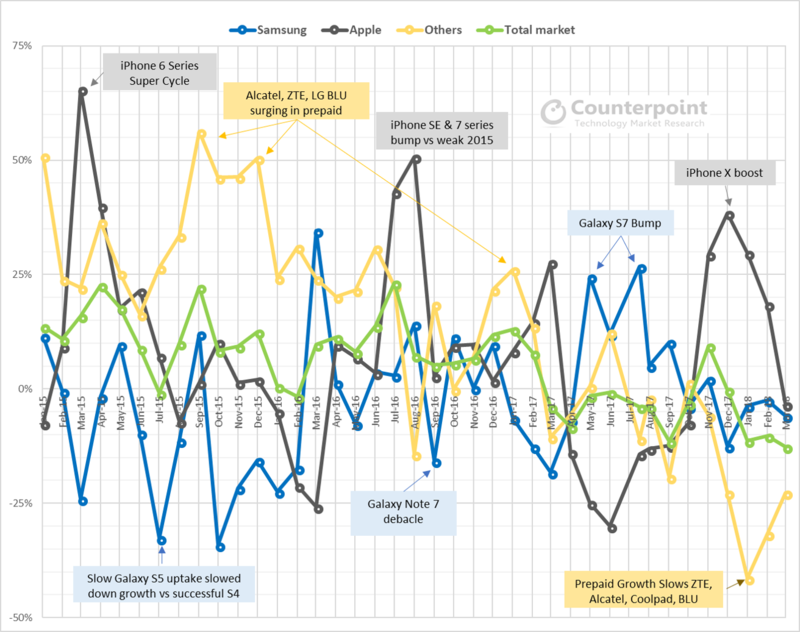 Counterpoint’s Market Pulse service tracks OEM-level smartphone sales monthly. 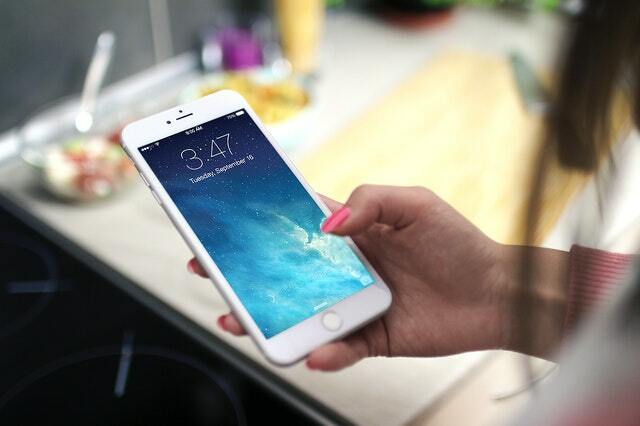 Apple growth percentage is declining during launch periods. However, it has gained overall US market share because of its increasing installed base and B2B and prepaid channel improvements. Samsung growth curve is slipping. There is increased difficulty maintaining momentum through product lifecycles. During periods of prepaid weakness, ‘others’ performance declines. Others saw a drastic dip during the first quarter. The overall US market growth is on a downward slope outside of Apple launch periods. 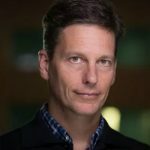 Please feel free to reach out to us at press(at)counterpointresearch.com for further questions regarding our in-depth latest research, insights or press enquiries.